On Wednesday, we restated the construction of Hostel Project. Monks are busy filling 2 water tanks from the hand pump bore-well as we have not drilled the second bore-well due to unavailability of bore-well driller machine. So, until September beginning students have to fill the water tank at morning and evening and pour water on completed concrete structures. Ven. Lobsang Tenzin and Ven Chimey are two supervisers, and they say that weather is too sunny and hot, feels very hard for the Indian labors to complete the bed-concrete for the rod pillars within two days. So they expect to wait for another one day to complete the bed concrete. Both of them looks very dark (burn under sun) under the hot sunny and they said it is really hard to stay inside the room at afternoon due to hot weather. So, they are staying inside the maize fields to relax for an hour at Lunch break. At the end of rainfall season, we are going to start the Construction project again. Contractor and labors will attend the construction site from Wednesday. We will get with you more news during construction. One of our member Ven. 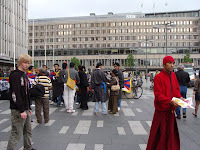 Tenzin Thinley is presently at Sweden; he is working hard for the project. 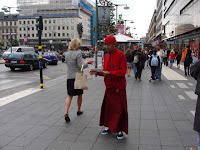 He distributes our Pamphlets to fund raise the project and has good response from Dharma Friends. We are thankful for Denise and family for welcoming Ven Tenzin la to Sweden and Mr. Steve Green for his valuable job on web designing and Louisa Nunn of UK and also to our USA friends. 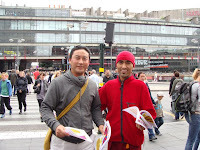 Ven Tenzin la has met with Tibetan group and time with them also! It is really auspicious day for Ngari Khangtsen to meet with people of same mother tongue and raise a voice for Tibetan cause and distribution of informative letter on Tibetan issue.